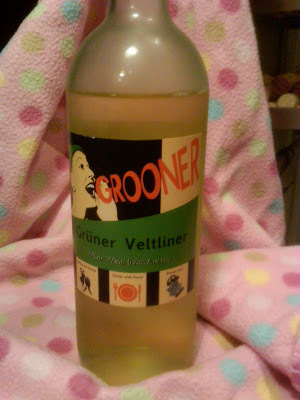 Not familiar with Grüner Veltliner? This zingy Austrian white is all the rage with the hipsters who have grown tired of Riesling's re-re-rebirth. It's also a pretty popular alternative to lighter whites and especially good with both food and conversation. In what borders on patronizingly obvious, this bottling helps the buyer get past the awkwardness associated with pronouncing a wine's name by spelling it out phonetically: Grooner. A happy go lucky, quenching, fresh bite out of a crab apple alternative to New Zealand Sauvignon Blanc. More importantly, it manages to avoid the insipidness and/or astringent edge of many Grüners. Zing! Could have used those phonetics a few years back for Viognier!